Tekna TMP is a digital solenoid chemical dosing pump with Chlorine, Hydrogen Peroxide or Per-Acetic Acid control meter built in. It features a PT100 probe input for thermal compensation and comes with proportional control, over feed and alarm band settings, a statistics menu, flow sensor, level control inputs & alarm output relay and has password protection for additional security. This pump, available in only 4 sizes, can cover a wide range of performances, having a flow rate range from 2.5 to 110l/h and a back pressure from 0.1 to 20 bar. The power supply is 100÷240 Vac – 50/60 Hz therefore the same pump can operate with different supply voltage. The standard pump head is in PVDF, therefore has a high chemical compatibility with several liquid ends but is available in PVC as well, on request. 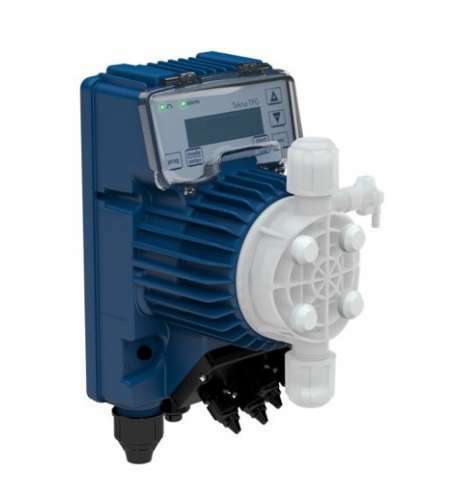 Tekna TMP series is also equipped with a manual priming pump for the start up. The pump is furnished with a complete standard installation kit, which includes: PVDF foot filter and injection valve, PVC suction tube, PE delivery tube. A PVDF-T installation kit is available on request.